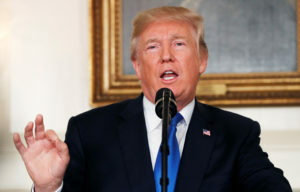 WASHINGTON — President Donald Trump’s Twitter cannon roared over the weekend as the latest turn in the Russia investigation seemingly placed him on the defensive. He denied he had ever absolved Russia of meddling in the 2016 U.S. election, despite his plentiful record of voicing doubts on that question. Over the past week, Trump also weighed in on the economy and infrastructure in ways that did not always line up with reality. TRUMP: “I never said Russia did not meddle in the election, I said ‘it may be Russia, or China or another country or group, or it may be a 400 pound genius sitting in bed and playing with his computer.’ The Russian ‘hoax’ was that the Trump campaign colluded with Russia – it never did!” — tweet Sunday. TRUMP: “Never gotten over the fact that Obama was able to send $1.7 Billion Dollars in CASH to Iran and nobody in Congress, the FBI or Justice called for an investigation!” — tweet Sunday. TRUMP: “General McMaster forgot to say that the results of the 2016 election were not impacted or changed by the Russians and that the only Collusion was between Russia and Crooked H, the DNC and the Dems. — tweet Saturday. McMaster said the indictment provides “really incontrovertible” evidence of Russian malfeasance in the election. The indictment does not allege collusion between Russia and the Trump campaign and does not assert that Russia’s deeds tipped the election in Trump’s favor. But Mueller’s investigation continues and nothing is ruled out. TRUMP: “Black unemployment is at the lowest level in history. Hispanic unemployment is at the lowest level in recorded history, which is really something that’s so great.” — remarks to state and local officials at the White House on Feb. 12. THE FACTS: Wrong on both counts. Trump was citing outdated numbers. Ten days earlier, the government reported the black jobless rate jumped nearly a percentage point to 7.7 percent in January, higher than most of last year and barely below the 7.8 percent of January 2017 when Trump took office. It indeed hit a record low of 6.8 percent a month earlier. Hispanic unemployment also rose in January, though marginally. The rate stood at 5 percent, up from 4.9 percent the month before and from the record low of 4.8 percent seen in April 2006 and several months last year. Jobless figures for blacks and Hispanics can jump around from month to month, such that any record can be short-lived. The unemployment rate for whites is consistently much lower than for the other groups, now 3.5 percent. TRUMP: “I do have to say that we do have a pool of 100 million people, of which some of them — many of them — want to work; they want to have a job. A lot of them do better not working, frankly, under the laws. And people don’t like to talk about it. But you’re competing against government. And they have great potential. They sort of want to work, but they’re making less if they work than if they stay home and do other things. So we have to address that situation. That’s a big problem. But we have a pool of 100 million people, a lot of whom want to work.” — meeting with lawmakers Tuesday about trade. THE FACTS: “Some of them” is true. But that’s not true for most. Trump’s pool of 100 million (actually 95.7 million, according to the government) consists of all Americans 16 and older who are not working. Of them, only about 5.2 million say they want to be. The vast majority is made up of students 16 and over, the elderly and people who want to stay home to raise their children. That information comes from the same government survey used to calculate the unemployment rate. The economy is already considered to be close to full employment, meaning it’s harder to find workers to fill new jobs — harder still if Trump succeeds in curbing immigration. Few economists blame social programs keeping large numbers of people at home and out of work, as Trump appeared to do. Instead, recent economic research suggests opioid addiction is a key reason many Americans can’t get or keep jobs. And past episodes of widespread imprisonment are also a factor: Having a criminal conviction makes it hard for people to find work once they are out of jail. TRUMP: “This will be a big week for Infrastructure. After so stupidly spending $7 trillion in the Middle East, it is now time to start investing in OUR Country!” — tweet Feb. 12. TRUMP: “I said this morning as of a couple months ago, we have spent $7 trillion in the Middle East — $7 trillion. What a mistake. … $7 trillion in the Middle East, and the Middle East is far worse now than it was 17 years ago when they went in.” — remarks at White House infrastructure event. Third, some of the spending he calls a “mistake” reflects his own policy decisions. It finances the military effort he brags about against Islamic State militants and his continuing push for U.S. aims in Afghanistan, Syria and Iraq. He’s added a few thousand troops in Afghanistan and committed the U.S. to remaining there indefinitely. The Pentagon estimates that wars in Afghanistan, Iraq and Syria have directly cost U.S. taxpayers more than $1.5 trillion. To be sure, actual costs are higher. Boston University political scientist Neta C. Crawford, as co-director of the Costs of War Project at Brown University, estimated that as of September, U.S. wars in Iraq, Afghanistan, Pakistan and Syria — plus additional spending on homeland security, the Pentagon and Veterans Affairs Department since the 2001 terrorist attacks — cost more than $4.3 trillion. That rises to an estimated $5.6 trillion or more when anticipated future spending on veterans and other factors related to the wars so far are added. Although that’s an expensive commitment, it’s far short of the $6 trillion or $7 trillion that Trump has been citing for several years, first as a candidate, then president. Even scholarly estimates involve ballpark projections, not just money that is gone. Associated Press writers Robert Burns, Christopher Rugaber and Josh Boak contributed to this report.